Day Trips from Pokhara | Adam Tours & Travel Pvt. Ltd.
1. Sunrise view and Hiking Tour: In order to see early sunrise and Mountain View, you need to wake at 5 am. Our agency provides a Tourist car and a professional, trained licensed and experienced guide to take you to Sarangkot (1591 M). From Sarangkot, you will be able to see amazing sunrise view and splendid view of several mountains like Annapurnas, Dhaulagiri, Fishtail, Manaslu and so on. Moreover, you will see green hills, waterfalls, rivers and so on. Then you will hike to Kalika Temple, Deurali and reach to Naundandato catch a car to the Hotel from Naundanda POkhara. The walking duration is 3 Hours. On the way back to Hotel, you can stop at Tashi Palkhel , Hemja to observe the pray of Minks at 3 PM. It is a full day walk , which starts from lakeside.You walk about 3 hours to Sarangkot, have lunch, observe the view of the Pokhara Valley, Mountains, waterfalls etc in 300 degree. Then, see the rural life, experience Rural people’s activities. Then walk to the Hotel via the northern bank of Phewa Lake. After Breakfast at your hotel, drive by private car to Kande and walk 2 hours up to Australian Camp. Australian Camp is a nice and wonderful Hill Station. Have lunch and then walk another 2 hours to Phedi and drive back to Pokhara. You will also see the Rhododendron Flower this day. After breakfast, our car will drive you to Milanchowk and start hiking.Aftwer two hours of walking you will reach to Astam, which is mix culture village and you can see the amazing view of the Mountain, Rivers, waterfalls etc. Then you drive to Dhampus, whose settlement is more of Gurungs. After that you walk to Phedi and take a car to Pokhara. This day is quite long walking day. It may need t to walk about 8 hours this day. After breakfast at Hotel, we take you Phewa lake and cross the by boat and then you walk to the World Peace Stupa. 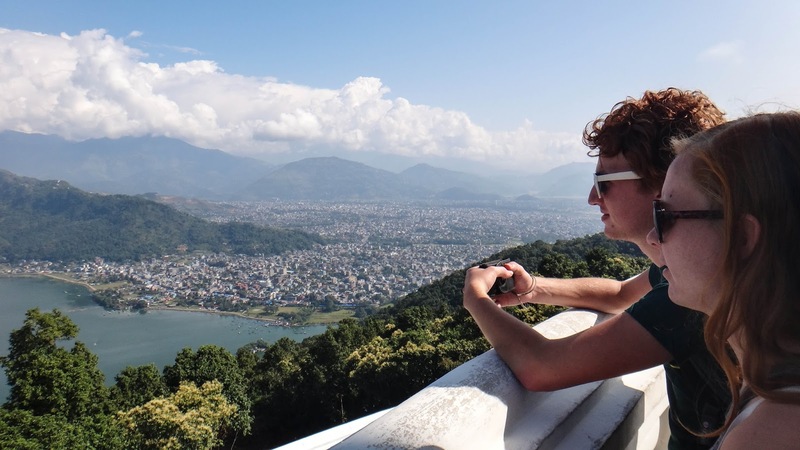 You can see the whole lake, mountain view,whole Pokhara Valley and much more. Then you can walk upto Raniban Resort . After that you will walk down to Davi’s Fall , observe it and walk or drive to the Hotel. After breakfast, our car will drive you to a place called Dobilla, see the Seti River and walk to Phoksingh Hill. It will be a wonderful walk through local villages and several Orange Farms.This area is the best area for Orange farming. Then walk to Chhorepatan and drive to the Hotel. After breakfast, drive to Kubinne Bhanjyang, walk to Mattikhan Hill, Go to the Tower to observe the amazing view of the whiole Pokhara Valley, Panoramic Mountain view and much more.Then walk down to Powerhouse , walk up to Biruwa Khet and then drive to the Hotel. Drive to Ranipauwa, walk about two hours to the top of Kahun Hill via Karki Danda . After wonder village walk of the whole day return to the hotel by car. Drive to Bijayapur , walk to Kalikasthan . Observe the village atmosphere , take photos, have lunch and walk and drive back to Pokhara via Begnas lake. Drive to Begnas Lake , the third lake in Nepal, boating across the lake. Then have lunch in the local restaurants , walk upto Pachbhaiya Hill to see the view of Rupa lake and Begnas Lkae. Then you will arrive Begnas Buspark and our car will pick you up from there. Drive to MIlanchowk, walk to Astan and Dhamus.Then have lunch and then walk to Australian Camp. Early in the morning, you will have an amazing opportunity to see the morning scenery of the Mountains, Sunrise and much more. After breakfast , walk to Phedi and drive to Pokhara. Drive to MIlanchowk, walk to Astan and Dhamus.Then have lunch and then walk to Australian Camp. Early in the morning, you will have an amazing opportunity to see the morning scenery of the Mountains, Sunrise and much more. After breakfast , walk to Bhaudare an dhave lunch. Then walk to Panchase BHanjyang and over night stay at Hotel. Next morning , go to the top of Panchase and see the amazing view of Mountain and much more. Then walk to Ghattichhinda and drive to the Hotel.